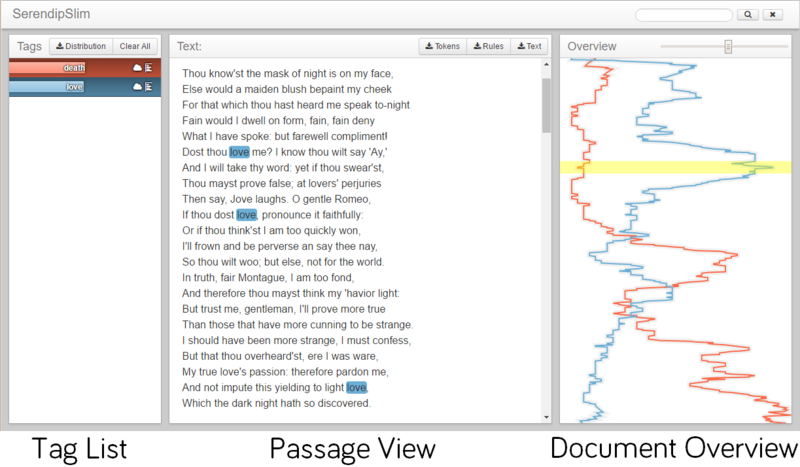 SlimTV (short for Slim TextViewer) is a tool for reading and exploring documents of tagged text. It can be used in conjunction with other VEP tools like Ubiq and Serendip, or as a standalone tool for creating and applying custom tagging schemes to individual documents. The list of tags on the left displays their proportions within the document by the size of the horizontal bar within each button. These buttons can be used to toggle each tag on and off, which will cause that tag's words to be highlighted in the passage view and its line to be highlighted in the document overview. A visualization of a tag's distribution throughout the document can be viewed using the button for each tag. This can be toggled from bar charts to word clouds. This portion shows individual passages of the document, using colored highlighting to display any tags that are currently toggled on. Clicking a word will toggle it's tag, if it is tagged. Readers can scroll up and down in this view through the entire document, or else navigate using the document overview. The slider on the top of the overview controls the smoothing factor of the line graph. Downloading data: Through buttons showing the icon, users can download different aspects of the tagged document data, including a file representing the tagged tokens, the untagged text as displayed, the overall distribution of tags throughout the document, or the distribution of words within a given tag. The CSV or TXT files from these downloads can be used with other analysis tools and methods. Search: By hitting Ctrl-F or typing in the search box in the upper right, users can find instances of individual phrases within the document. Search phrases are tokenized using the same algorithm as the built-in tagger, and are then matched token-by-token to the full text of the document. Hitting Enter or Submit repeatedly will scroll through each match of the search sequentially. Matches are also represented in the overview as yellow bars on the left side of the line graph visualization, and highlighted in yellow within the text. SlimTV (short for Slim TextViewer) is a tool for reading and navigating tagged documents. You can either import a pre-tagged tokens file, or upload a new text document and a set of tagging rules. If you have a CSV tokens file representing a tagged document, upload it here. Note: If you are opening a document tagged with Ubiq, you will want to use the following file dialog box to open the corresponding file in the token_csv directory. Each line should contain a rule of the form phrase, ruleName. *Ramped from light tint to heavy tint by increasing ranking within topic.